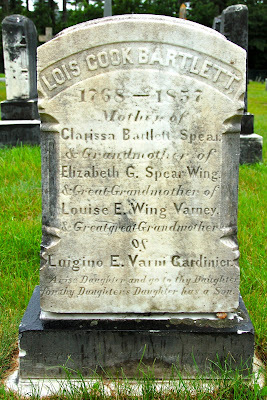 I haven't been able to track down any information on Lois Cook Bartlett of Brunswick, ME, but I was enchanted by her headstone. for thy Daughter's Daughter has a Son." An inscription on the gray stone underneath the marble notes that five generations of descendants attended Lois' burial. Does anyone recognize that daughter's daughter quotation? I poked around on the internet and found a few similar quotations in New England captivity narratives, but I'm not sure of the source. It sounds scriptural, but, as far as I can discover, it isn't. This stone is a late example of the practice of noting the extent of an elderly person's posterity on his/her gravestone. While not tremendously common, these stones crop up all over New England. A friend of mine who recently traveled to Utah for a grandmother's 90th birthday party assures me that modern Mormon gravestones often list the deceased person's children (you see this in New England sometimes, too). I don't know if that's a long-standing tradition that goes back to the Mormons' genealogical links to colonial New England or if it is a new trend. No specific comment to this specific post, but I just stumbled upon your blog and it is fascinating! I've added it to my bookmarks list and will check in often. I'm a fellow history student who has done a lot of research in cemeteries in Arkansas and Massachusetts, so this type of thing is definitely something that interests me. Fascinating. That's got to have a discrete source somewhere. There are a number of examples beginning in the early 1800s from widely separated locations, in both the son variant and daughter variant. Almost all are epitaphs/memorials to notably old women (like "curious news" items in the paper). Aha! Got it (sort of): Here it is in an old source with odd citations that I haven't tried to follow. But this is the route to the answer. "A Distich, according to Zwingler [whoever he is], on a Lady of the Dalburg Family who saw her descendants to the sixth generation."